It’s finally arrived – the One Million Masterpiece Official 2008 Calendar. Every corner of the masterpiece has been scoured to find the images that make up our twelve themed montage images. This year of design team had a tough job, with thousands of beautiful, though provoking, popular and funny contributions to choose between. The initially category list has been modified slightly to take account of the quality and number of images available, so now we have spectacular mosaic images representing themes such as Water, Heat, and Black & White. Each high resolution image is printed in full colour to make the most out of the amazing detail of each contribution. Every artist is fully credited within the calendar with their name. The calendar also includes details of the project on the front cover and an invitation to join, which makes it a great Christmas gift for family and friends who haven't yet joined! 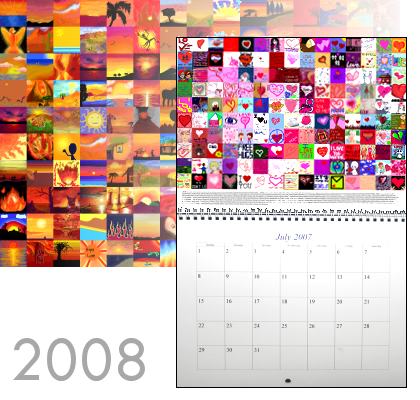 Calendars will be produced and shipped worldwide by our print partner deviantArt. This year each calendar measures 11in x 8.5in (28sm x 22cm), is spiral bound through the centre and consist of 14 printed pages: 1 front cover, 1 back cover and a page for each month. Additionally, they have an extra heavy protection sheet for safe hanging. All profits made from the sale of calendars will be donated to the OMM to help cover project running costs. Calendars can be ordered via Paypal from this website here, or via the deviantArt website here. Please note that a wider range of shipping options is available through the deviantArt website (see below). Worldwide shipping can vary dramatically. Please place your order by 7 December to ensure delivery within the US by 24 December. For the UK and Europe add two working days. Additional time for other international locations may vary. If you require faster deliver for Christmas (using Fedex or UPS premium delivery) please order directly from deviantArt here where a wider selection of delivery options is available. i'm really amazed that my piece has been picked for the October one, its definitly not my best piece lol. I feel special. 1 out of 1800. No really, I feel special. Woot! I'm in it!!!!!!!!!!!!!!!!!!!!!!!!!!!!! Thank you for choosing my picture :) it's not the level of difficulty I usually use, but I knew that making it so simple could be more touching than anything that could've taken hours to make :) I feel special to have my picture in feb, the month of my birthday. Thank you MMP! Woah...I can't believe I made it onto the calendar. How awesome! ^^ Congratulations to everyone who also made it! freakin yaaaay!!!!! I'm in marrrrch and 26th march is my freakin birthday, happy freakin birthday to freakin meeeee!!!!!!!!!!!!!!!!!! LOL!!! WOW!!! I'm on the December page! *Faints* And I am so NOT an artist! Wow! I actually made the August calendar! That's quite a HUGE honor for me since I'm not really much of an artist. I'm so lucky to be among better artists than me in any calendar. How much from the calendar goes to the charities? Hi Cassie, the annual calendar profits are used to keep the project going for another year. They enable us to keep going, and keep collecting subscriptons for the charities (remember, we are a volentary, non-profit organisation but we do have overheads). If there is any surplus it is donated to partner charities in equal proportions. Don't you guys think that those of us that have poured our hearts and souls, or 15 minutes, into making our little drawings should get a deep discount on the calendar that we are a part of? I vote for 90% off. my mother says she never received her 2007 calender! Mine's came today. Delivery successful. Well done again to everyone who made it.